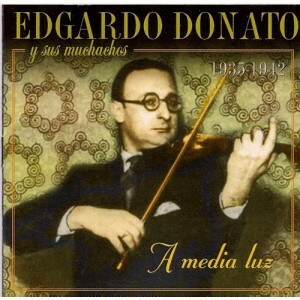 I was recently looking at the Edgardo Donato recordings in my collection when I noticed that some of the same tangos produced at the same recording date differ in duration. Certain El Bandoneón recordings are of a shorter duration than the corresponding recordings from other labels. I recalled that I have read before articles on tango blogs which mention this problem: Several El Bandoneón recordings are too fast in speed and therefore show a too high pitch (The problem seems to be even wider spread and is not limited exclusively to the El Bandoneón label). Therefore I decided to pass the El Bandoneón Chapaleando barro through a time stretching filter in Audacity, a very versatile open source sound editing software. The literature on time stretching algorithms allows to believe that the current state of art is quite good, especially when stretching at low percentages like in this situation. A turntable in their studio was running too fast maybe at round 80 R.P.M., certain labels like Pathé produced records which used to be played back at 80 R.P.M. A turntable was out of order and therefore running at a slightly higher speed which also confirms that the speed difference is not always exactly the same as I later noticed on other distorted El Bandoneón tangos. They used a variable speed turntable and manually affected arbitrary speeds between 78 – 85 R.P.M according to what sounded good in their ears, maybe even intentionally increasing speed to please their customers and a taste for faster music. But most likely they were just doing their transfers from vinyls which already had this pitch deviation. I would be curious to know what happened exactly in that studio but I think the 4th theory is the most plausible. For the tango recording Chapaleando barro I calculated a deviation of 8,2 % which would suggest that the playback speed during the transfer of the record must have been at around 84.396 R.P.M. (Please see this blog contribution on other methods for determining the acceleration factor, when you don’t have any reference tango at the correct speed at hand for a precise calculation). 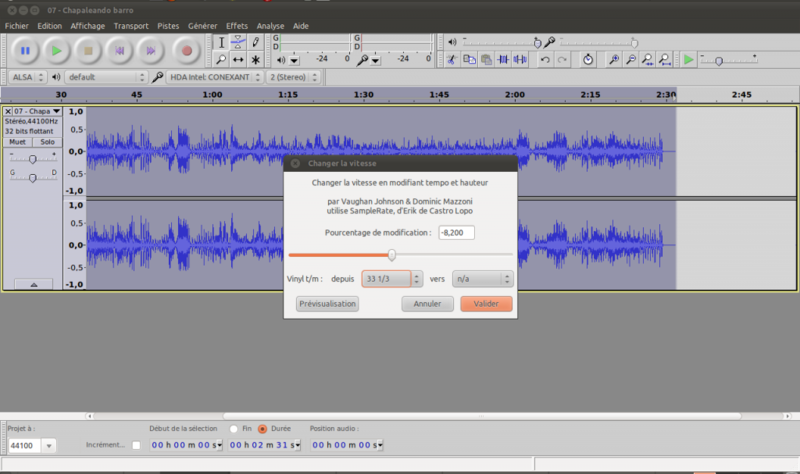 Open the sound file with Audacity’s open dialog. Select the whole sound file via the Edit menu, select all. Call the Change Speed, affecting both Tempo and Pitch filter dialog via the Effects menu. In the filter window the correction percentage has to be introduced with a negative prefix: -8.2 % as we want to have the filter slowing down the speed of the sound file. Best is to save the resulting file with a different name and the same meta-data, so you can later compare the duration if you have some reference versions of the same tango in your collection. To save the file use the Export menu which you can access via the File menu. Once the export is done, drop all changes to the open file. This permits to keep the original speedy sound file. I draw several frustrating conclusions form this experience. The first is that I recognise that I can’t trust some El Bandoneón recordings for accurate speed and I also see that DJs who are working directly with CDs, the old way, are potentially unable to correct these errors as you can’t just pitch these tracks down without getting some inversed Mickey Mouse effect. And the second is that it would take ages to correct all the speed problems with this kind of tangos, the filter passage can be time consuming depending on your CPU. What a waste! But after all it’s not so dramatic 😉 there is also the possibility to just tag these tangos as fast versions. Some DJs told me that they play the fast versions when the mood of the evening is demanding for faster music. Not everything coming from El Bandoneón is bad. In fact when I browse through my listings, I can see only a small amount of speedy versions. I like a lot of their CD editions because they have also compiled nearly for each CD a nice leaflet with extra information and the quality of their transfers is often quite amazing. I just recently brought back a big bunch of recordings from Barcelona. There is a very good shop close to the metro station Maria Christina called Blue Sounds where they have a huge selection of El Bandoneón CDs for takeaway. The shop is affiliated with the tango label but mostly specialised in Jazz records, most of which are coming from their own label. The shopkeeper told me that El Bandoneón stopped producing 3 years ago and soon when the stocks are sold out, these recordings will not be available anymore. in 1 day and 16:55 hours. in 6 days and 17:55 hours. in 14 days and 19:55 hours.